Although the neck gets a little high, it keeps players' condition without trouble in basic playability. Condition: Excellent condition [String height on 12F] 6 string side: about 2.8 mm 1 string side: about 2.2 mm [Fret remaining] 6 70% [Truss rod] 90 degree remaining on the tightening side [Year of manufacture] 1980's [Case] Soft case (There is a seal stick trace) Body: Alder Neck: Maple Fingerboard: Rosewood Serial number: 140161 Weight: 4.00 kg. Asia, Canada, China, Mexico, Japan, Australia. Europe, United Kingdom, Germany, France, Russian Federation. We do not mark merchandise values below value or mark items as "gifts" - US and International government regulations prohibit such behavior. 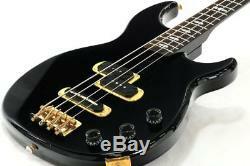 The item "YAMAHA BB-X Black Electric Bass Guitar used Excellent condition from japan sound" is in sale since Sunday, August 5, 2018.